I want communicate with total confidence so I can get more leads, more referrals, more motivated clients... More saleable listings and more commissions! Try the system for full 2 months. If you’re not completely happy with it, simply let us know and we will happily refund your entire purchase. No questions. No hassle. 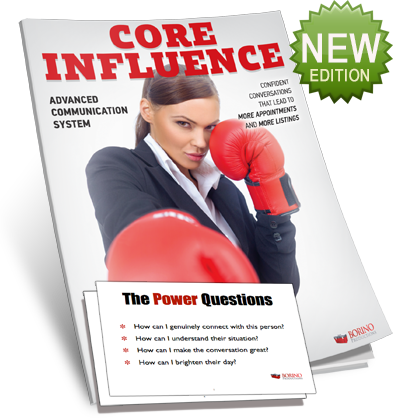 Instant access to the Core Influence course online with video lessons, tips and resources. Companion guide to the course with over 60 pages of script outlines, techniques, and notes. 42 cards with the most powerful conversations, questions, icebreakers, objection crushers, and more. Free trial membership with full access to over 100 advanced marketing tips, coaching, and systems that generate quality leads and listings quickly. Watch all sessions and interviews instantly and cancel at any time.